There is a LOT of buzz right now about the strength of web technologies for all kinds of development. CSS has always been a bit of a black art to me but as I’ve embraced developing with jQuery I’ve needed to develop some level of expertise. With HTML 5 and CSS 3 we get an incremental expansion of features. I got “The Book of CSS3” by Peter Gasston from the folks at No Starch Press. I also found the sections on using the visual features of things like transforms, animations, gradients, and fonts very useful. But, writing Client Side & Server Side code together can be tricky. I very frequently get email from customers experiencing a debugging problem whose answer is fund in confused or incorrectly mixed Client / Server coding. I found it not only a tutorial but a style guide. If you’ve been reading my blog for a while you already know that I love the Murach Books. Murach’s has updated their great C# book for v4 / 2010. If I were going to teach a course on C#, this is the book I would use. This book starts you off using all the best features of Visual Studio so you can begin productive work almost immediately. In fact, it has you create a simple business application in chapters 2 and 3 so you can see right away how the core features of C# and of Visual Studio work. Download these chapters for free, and see for yourself. When it comes to object-oriented programming, too many C# books resort to whimsical but useless metaphors, like illustrating objects by creating animal classes such as mammals, cats, and dogs. Then they leave it up to you to figure out how to transfer these concepts to business applications. In contrast, we present business objects such as customers, invoices, and products so you can see how OOP is used to create multi-tiered applications in the real world. Learning to use C# classes and OOP techniques isn’t enough. You also have to know how to code for the tasks that are required in most business applications. So this book builds on your skills in incremental steps to teach you how to validate data, handle numeric, date, and string data, work with loops, arrays, and collections, code methods and event handlers, handle exceptions, and work with text, binary, and XML data. You can’t create business applications without handling databases. So this book teaches you how to use C# 2010’s tools for rapid application development, like the data sources feature and data handling controls. It also includes introductions to ADO.NET coding and to LINQ, a feature that lets you query almost any data source…not just databases…using the C# language. Powerful stuff that’s glossed over in a chapter or two in most other C# books. This book presents complete, non-trivial applications that illustrate what you need to know on the job. Studying applications like these is the key to mastering C# development, but you won’t find them in many other C# books. The exercises at the end of each chapter let you apply what you’ve learned, giving you valuable, hands-on experience. And because we provide the starting points for these exercises here at our site, you get the maximum amount of practice in a minimum of time. If you haven’t ever used one of our books before, you may want to download a sample chapter before you buy. If you do, you’ll discover why programmers are so impressed by our "paired pages" format and why college students ask their instructors for Murach books. Not only does this format make learning easier and faster, but it also makes this the ideal reference book when you’re on the job. Like all our books, this one is backed by our 90-day trial period and 100% guarantee. It must teach you C# 2010 the way the best professionals use it, or send it back for a prompt refund. Enhancing your Organizational and Leadership skills. As we approach the end of the calendar year it’s common to reflect on what we’ve accomplished and focus on what we seek to accomplish in the coming year. I wanted to take the opportunity to share a couple of resources that I’ve been finding usefull. J.D. Meier (from our Patterns & Practices team) lives an alternate life as a management guru. If you really don’t want to buy the book you can read it all on line. Check it out and start planning for 2011 to ROCK ! I’m a huge fan of Murach’s books in general. I like books that I could teach a course from. This book is no exception, but I’m blogging about it for a particular reason. I recently wrote a blog post about our choices for developing Web Applications on the Microsoft platform. Choosing between ASP.NET–WebForms, MVC, WebMatrix – Choice is a GOOD thing. No matter what you choose for your web development stack, you’ll need a sound understanding of HTML and CSS AND the relationship between the two. If you’re somewhat new to web development or have always relied on the WebForms controls for output – this book will give you a great start. If you’ve written HTML and CSS from scratch this book will be an easy read for you and may fill in some of the gaps. As I’ve been focusing on developing jQuery expertise I’ve found this book useful to keep on my desk and refer to. Click [ HERE ] to check it out. It’s great to read a book that continues to have value after you’ve read it cover to cover. I now have a stack of Murach’s books on my desk 🙂 and this one is proving to be very useful, not only for the security stuff I’m doing but as I’m diving deeper into ASP.NET MVC and writing more client side code. BOOK – ADO.NET 3.5, LINQ, and the Entity Framework – AGAIN ! It’s no secret that I’m a fan of Murach’s books. I’m preparing to record a podcast on data access and so I pickup up this book. It covers the three primary data access technologies that matter to developers using current .NET development tools. Detailed coverage of all three makes this book a no-brainer. I read it cover to cover and it has assumed a bit of high-value real-estate on my desk !!!! Here is some of what it covers ! Over the next few weeks I’ll be updating all me recommended books on the ASP.NET website. PLEASE NOTE – these book recommendations on www.asp.net are NOT “listings. For a long time I’ve been largely a “web guy”. Not so much by choice but by circumstance, just like I was a main-frame guy in the 80’s. Full client applications are SO powerful. IN 2009 I really want to contribute to www.WindowsClient.net and, though I’ve done allot of work in Windows Forms, my WPF experience is a bit light and WPF is the future of Windows Client development. So, needed a book that would “plunge” me back into WPF thinking. Serendipitously, about the same time I was asked about doing a manuscript review for WPF in Action with Visual Studio 2008. I loved it, as you will tell when you pick up a copy of the book and see my comment on the back cover !! 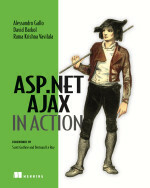 I read so many books that I can almost guess in advance based on the publisher, series or author how good a book will be and the “In Action” series books are generally great but WPF in Action with Visual Studio 2008 is especially good becuase it is both details and professionally practical. It does waste paper teaching me how to build fractals or stick drawings in XAML but takes a quickly passed serious approach to getting the reader up to speed to do REAL work. It’s Visual Studio 2008 based so it’s both current and based inside the tools we use to developer WPF applications. It makes comparative references to Win Forms, etc, so it sets content in things we already understand. It has good coverage of the new Layout Mechanism which is different than previous UI technologies. It has great “advanced” sections on Interop and Threading based Performance. J.D. and the very smart folks over in the Patterns and Practices group have been at it again and have published another GREAT development resource. – J.D. Meier , Alex Homer, David Hill, Jason Taylor , Prashant Bansode , Lonnie Wall, Rob Boucher Jr, Akshay Bogawat. It’s downloadable as a PDF file and is a simply incredible Application Architecture Guide. Now if I could just get it for my Kindle ! I consistently meet good developers who are not database “experts”. Many of us had a good deal of formal education on Data Structures, Algorithms, Patterns, Syntax, Methodologies, but learn about developing with Databases and the associated tools a little bit as a time as our work took us through the process. Murach’s has just updated their great book on SQL Server for Developers for all the 2008 versions from Microsoft. Not only does it provide detailed enlightenment on all the “tools” like the SQL 2008 Management Studio, but it’s full of practical “How-DO-I” stuff. For example, we all know that binary or other “un-typed” data can be stored in a Table Column of type “BLOB”. But how do I get stuff into and out of a BLOB field. See Chapter 19 on working with BLOBS. The intro shows the T-SQL Syntax for INSERT statements to work with a BLOB. But later in the chapter comes a whole sample application with C# code !!! My Buddy WBM has release a new eBook ! I’ve spent allot of time in my career focusing on Software Security. I’m also a bit of a VoIP geek. So Hacking VoIP: Protocols, Attacks, and Countermeasures was a treat for me, especially since it uses Asterisk which is a hobby of mine. I highly recommend it if you are remotely interested din the subject ! At the top of this book it says “TRANING AND REFERENCE” in capital letters. That sums it up 🙂 1000 pages of soup to nuts learning about developing ASP.NET applications in C#, updated for ASP.NET 3.5 and C# / Visual Studio 2008. In addition to all the concepts for ASP.NET, C#, OOP, IIS, etc, the book has sections on Data Access (AND LINQ), AJAX, Listview & Datapager, CSS and more. Murach’s makes great textbook style learning material. As I’ve said before. if I were teaching a college class on the subject, this would be on the short list for the textbook of choice. If I were going to teach a course on ASP.NET Development with VB – THIS is the book I would teach it from ! Get a a copy ! There is no faster or better way to learn ASP.NET web programming using Microsoft’s Visual Studio .NET than to use “Murach’s ASP.NET web programming with VB.NET.” To get you off to a fast start, the first 5 chapters show you how to use Microsoft Visual Studio to design, code, and test multi-page web applications that use view state, session state, cookies, database data, and code-behind files. From there, you learn even faster as you master the core professional skills like HTML, server controls, validation controls, state management, and user controls. Then, you learn how to use the best ADO.NET features for working with a database in a web application including: connection pooling, data commands, parameterized queries, caching, data views, command builders, and the Repeater, DataList, and DataGrid controls. Already know how to code Visual Basic 2008 desktop applications? Then, you’re ready to master web programming with the 3.5 edition of this best-selling ASP.NET book from Murach Books. This book written by Granville Barnett and Luca Del Tongo is part of an effort to provide all developers with a core understanding of algorithms that operate on various common, and uncommon data structures. Data Structures and Algorithms: Annotated Reference with Examples is completely free! Ok readers. Check out this little nugget. Matthew Ellis and Magma Interactive just released the ASP.NET 3.5 AJAX Pocket Guide. It contains concise chapters packed with useful info for the ASP.NET AJAX Developer including a Client Side Reference, a Server Side Reference, Web Services, Extender Controls, The Control Toolkit and more. At $1.26 per chapter – It’s almost FREE ! Here is a GREAT quick read on ASP.NET Data Controls for you. PACKT is not one of the “big” publishing companies, which can be a good thing because that often publish books on specific topics that are left un-covered by the usual suspects. One of their slogans is “Community Experience Distilled” which I think really nails them. This book is spans about 240 pages exclusivly on ASP.NET Data Presentation controls. Bets of all it contains coverage of both 2.0 and 3.5 concepts like LINQ, the new 3.5 ListView & DataPager controls and using VS 2008. If you are an avid reader, like I am, then you know that different publishers tend to have different styles and specialties. Murach is unique. They don’t publish TONS of books, but the ones they do publish fill an interesting space. Murach has updated this book to include the 2008 topics. I dug into to recently because I was doing some interesting things with Microsoft new Dynamic Data technology which makes much use of Partial Classes. It’s fully up to date with the 2008 stuff ! Click on the book link to check it out at Amazon. This is another one of those “Sniper Topics” that I like, again from PAKT Publishing. Not only does this text enumerates the namespaces in the Microsoft AJAX Client Libraries, and provide good coverage of the Client Component Framework, but it teaches all the “whys” along with the “How Tos”. If your building AJAX applications and Microsoft’s AJAX technology is at the center of your work then this book is a “must read”. And some more information from their February Release Announcement…. The Web Client Software Factory (WCSF) provides a set of guidance for architects and developers building enterprise Web applications. The factory includes samples, reusable code and a guidance package which automates key development tasks from within Visual Studio. Using the Web Client Software Factory assets, developers can create Composite Web applications composed of independently developed and deployed modules. These modules are dynamically brought together at runtime into a common shell. Additionally the factory includes support for ASP.NET AJAX thus providing users with a richer and more responsive user experience. The February 2008 release of the Web Client Software Factory has the following improvements to the June 2007 release. − Added ASP.NET AJAX extenders for Context Sensitive Autocomplete, AJAX Validation, and Real Time Search that can be used in existing ASP.NET sites and ASP.NET sites built using the Composite Web Application Block. − Added UI Composition capability through extending our dependency injection mechanism to support Pages, User Controls and Master Pages. − Added Dependency Injection on ASMX Web Services and JSON services. − Added a new Order Entry Reference application that demonstrates all of the new functionality. My buddy Dave over at Encosia has a few free copies to give away. Comments Off on Free Manning ASP.NET AJAX in Action ?? If you’re an ASP.NET Developer – you MUST get this book. It’s simply one of the best Tech Books I’ve read and a GREAT tutorial on MS AJAX. I’ll be publishing sample from the book here over the next several weeks. Down this one to get started. What is your favorite ASP.NET Book ? I’m working on adding a books recommendation section to the ASP.NET forums. I’ll only be recommending books that I’ve actually been able to review myself, since I really want the value of the recommendations to be very high and topically specific. If you have a favorite book about any specific ASP.NET (or related topic like IIS) please let me know. (Use the contact form and tell me the Title and Author). I’ll get a copy of the book myself and if I agree, I’ll add it to the list of recommendations! Comments Off on What is your favorite ASP.NET Book ? A collection of very cool guidance for the wizards over at Microsoft Patterns and Practices on using Visual Studio Team System . If you work in technology then your probably know that Addison Wesley publishes great books. InfoPath is a very interesting technology, and one that I think is a little under exposed and documented. This book is a definitive source for InfoPath power users and developers. InfoPath is the perfect tool-set for Enterprise developers and power users who need to rapidly develop applications that manipulate their operational data. This book has great coverage from both perspectives, the power user and the developer. If you’re a regular reader of my blog then you probably know that I’m a big fan of the Murach’s books and Murach’s SQL Server 2005 for Developers is no exception. If I were teaching a course on SQL for Developers this would be the text book that I’d use. It even comes with an Instructor’s DVD. While it contains the expected academics, it also includes lots of “real world stuff”. In addition to the basic mechanics of programming against SQL Server it includes great sections on things like SQL Database Design and a SQL CLR drill down. It also includes cool advances sections like all about working with temp tables. This one will stay on my in-reach book case. Hope you pick up a copy. Early chapters are now available online via their early access program. Click here to learn more and start reading it today. Quite some time ago I reviewed a manuscript for Raymond Chen’s new book “The Old New Thing”. Now if you don’t know who Raymond Chen is (which means you’re probably not in software development), he’s been at Microsoft for a really long time and is often the smartest guy in the room. So I got a pre release copy of the book. It’s part technical education, part Microsoft Products history and part geek entertainment. It’s fun to read and full of great info and anecdotes about the development of Microsoft’s products.